On the street, Alicia Carberry hunts for fresh paint. Sporting a bright green shirt stamped “volunteer,” the Bloomfield resident of four years sets out on her second graffiti paint-out with the Southside Community Council’s Graffiti Watch. Toting a wagon filled with paint gallons in six basic colors, rollers and brushes, Carberry and her volunteer partner are determined to relieve the neighborhood of graffiti. While making their way through the brick fields of Southside’s budding graffiti scene at Carson and 21st Streets, a man approaches them and starts yelling. “Who gives you license to paint over this? Why would you do that?” he said. Carberry says nothing. After the fact, she says the man had probably painted graffiti or was standing up for another graffitist. Steve Root heads the council’s Graffiti Watch, where he has led something of a street war for the past eight years. Like most urban areas, Pittsburgh has no shortage of graffiti. To name a few cases, a self-proclaimed “Lord Keli” hit the Birmingham Bridge, and a peace sign/smiley face/heart trifecta dotted Dave and Andy’s sign in Oakland earlier this semester. Other markings litter the streets, particularly in South Oakland and off-campus. With miles of concrete canvas to paint, graffitists have left their marks throughout the city, rarely getting caught in the act. Graffiti is a covert crime that leaves overt, lasting marks on bridges, buildings and bypasses in Pittsburgh. Some call it street art, while others see it as vandalism. Either way, it’s an expensive offense, both for the city and for charged vandals. Pittsburgh spends $350,000 annually on graffiti clean up. A person found guilty of an offense can receive anything from a $250 fine to a third degree felony for every $5,000 in property damage, depending on severity. Jeremy Raymer, a Lawrenceville resident and Pitt alum who graduated in 2011 with a degree in electrical engineering, is a graffiti artist who works within the law. Raymer receives commissions and asks for permission to paint street art on buildings. His portrait of Bill Murray, made of small bursts of spray paint in a technique he calls “graffiti pointillism,” watches over diners inside Stack’d on Forbes Avenue. He’s also painted a portrait of Nikola Tesla at Voodoo Brewery in Homestead. On a recent Saturday morning before the restaurant opened, Raymer set up shop inside Stack’d. About $2,000 worth of Montana spray paint cans clutter his makeshift studio, filling up boxes, the floor and his army bag. Raymer nods his head, looking at his work-in-progress of Murray on the wall and at a smaller picture for reference. EDM blasts through his earbuds and he breathes through his surgical mask as fumes fill the space. Raymer said Pittsburgh is a prime target for graffiti because of its “industrial vibes.” A constant stream of railroad boxcars tempt taggers looking for an illegal ego boost. Back on the streets, Lawrenceville, the Strip and Southside are riddled with illegal graffiti. The spray paint remains of graffiti fiends fall on the city’s graffiti clean-up crew. As graffiti foreman, Brentley leads two other members of the Graffiti Busters, the team that makes up Pittsburgh’s Department of Public Works graffiti removal program. The Busters report to graffiti complaints from Mayor Peduto’s 311 line that come in from community groups, police officers and volunteer “anti-graffiti activists.” They clean up graffiti on a case-by-case basis, depending on the severity of the damage done. During the workweek, the Busters load up their public works truck and head out when the sun rises. They use three techniques to clean up brick walls, alleyways and doors. A chemical spray and power-wash work best on smooth surfaces. For highly visible buildings, they coat on chemicals and pressure wash with a hose. For underpasses, abandoned buildings and places that graffitists have hit before, they paint over the graffiti with four or five primary colors. In 2006, Pittsburgh had a graffiti task force in the police and public works departments. It handled a total of 125 cases until Mayor Peduto disbanded it in 2013 in order to get police officers out of the office and into the community. But there are rumors of its return, according to police officer Alphonso Sloan, a former detective. Public Works Director Mike Gable said the city is considering reinstituting the task force because the city’s graffiti scene is escalating beyond the Busters’ reach. When the task force was active, Sloan and two other officers catalogued pictures of the city’s graffiti and compiled it into a tracking system. To identify graffitists, the task force compared tags on the street with those in the database. Once they got a match, they would go back to the crime scene to gather more evidence. If the task force found enough proof, it would interview suspects. “Nine times out of 10, we usually [got] a confession,” Sloan said. The task force’s criminal repertoire included the 2008 case of graffiti legend Daniel “MFONE” Montano. Over the course of three years, Montano managed to spray graffiti through East End neighborhoods and the South Side. He turned himself into the police two days before his art exhibit opened at the Mattress Factory in North Side. Officials found him guilty of 79 counts of vandalism, which cost the city $713,801 in damage. Authorities handed Montano a bill for a 2 ½ to 5 year prison sentence, 10 years’ probation, more than $232,000 in restitution and 2,500 hours of community service. Montano was arrested again in 2012 for an unrelated theft while he was on parole. Montano was a member of graffiti crews Not Strictly Freights and Jive Young Kids. Sloan estimated Pittsburgh has about 30 tagging crews, which are groups of graffitists who normally don’t engage in other criminal activities. Full-Time Crew and Most Hated Artists are a few other notorious groups. The crews range in size from four people to teams of 30. The city also has gang taggers, who, Sloan said, are more serious. In July 2007, a gang sprayed a rash of graffiti in Stanton Heights. It tagged 30 or so homes, set fire to several buildings and shot up a vacant elementary school after hours. But not all graffiti is violent. In the southern borough of Rankin, the Carrie Furnace serves as a legal graffiti sanctuary for compliant graffitists. 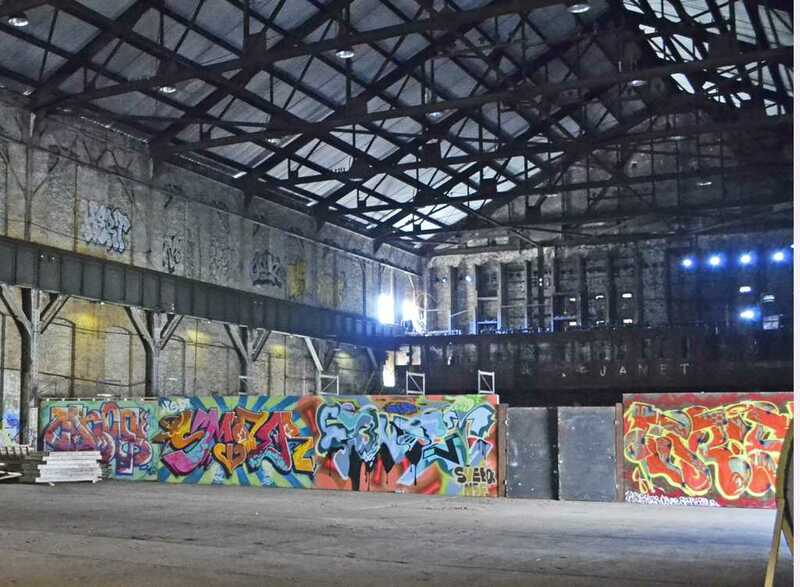 The former steel-making site is home to the Carrie Furnace Graffiti Project, a program that aims to provide a space for graffiti artists to create sanctioned masterpieces. “This is our playground,” said Shane Pilster, the liaison for the project. Pilster is also the 33-year-old founder of the graphic and web design brand 82 Concepts. Wooden pallets clutter the cement perimeters of the furnace’s warehouse, and aerosol murals litter the walls at eye level. Still, graffiti is a fringe crime that can cost the graffitist money, freedom or even his life. In 2003, authorities charged a graffitist known as Reke with three felonies for spraying graffiti on Penn Avenue with four others. Although he stopped painting graffiti in 2011, Reke did not want real his name used in the story. Authorities charged him with a $10,000 fine for the incident. Reke said no matter how much the city and community groups try to stifle graffiti, the aerosol scrawlings will always reappear.